You are the owner of a gym and fitness center or a sport club and planning to create a professional website for the purpose of promoting your services. You have looked for a lot of themes on the internet but still didn’t find the one to your satisfaction. WPOpal is so happy to be here to help you resolve your issues. List of Top 12+ best gym and fitness WordPress Themes 2017 below includes the most awesome themes of highest rating in term of gym and fitness which can help stop wasting your time looking around. All of these best gym WordPress Themes are Mobile Optimization, High Resolution, Powerful Plugins & Features, Unlimited Color Options, Multiple Languages, and Ease of Use. Let’s check it out! EXGym – Eye-catchy designs and a smart choice to building for any Fitness Center, Sports, Gym & Fitness, Yoga studio websites, Fitness classes, Yoga meditation, Gym, Dance and Dancing class, etc..
thanks to building on 100% Open source WordPress in the latest version 4.9, EXgym allows users tailor endlessly any part of theme to fit your desire. Besides, this theme is integrated a plenty of Plugins to ensures smooth appearances and nice user experience. 05+ Amazing Homepage, High Revolution Slider , Visual Page Builder, Powerful Mega Menu, 18+ pre-made elements. Ease to use and super suitable for users with zero programming skills as well as advanced developers are the useful advantages need to be counted. 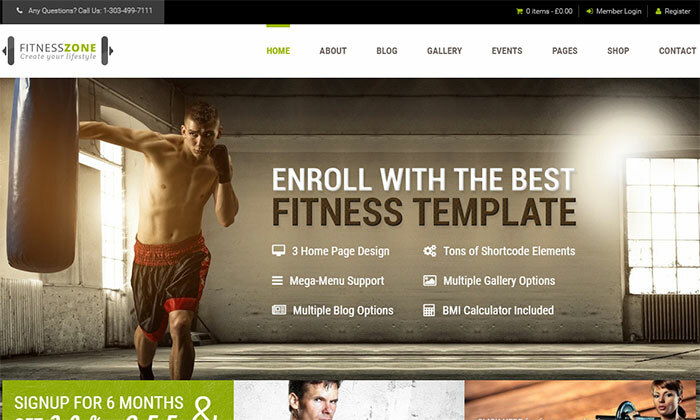 Fit is a well-designed and developed premium theme specializing in Fitness and Gym websites. As the other WordPress themes, it is characterized for its simpleness, ease of use and no need for any code effort. The theme has been improved through 4 versions with various powerful features such as fully localized (.po .mo included), 10 well organized PSD files, rich options to change any colors of the website in the admin etc. Also, Fit has a fully responsive design which looks great from a desktop view to a smaller mobile resolution. As the name suggests, Vigor is specially designed for Coach – Sports Clubs, Fitness Centers & Courses, Gym, Fitness Clubs, Personal Trainers, Health Centers. With its powerful flexibility, you can also create a great website in other sectors depending on your personal need. The theme is built with Bootstrap, the fastest WordPress Page Builder, Slider Revolution and numerous options that can help customize your site with ease. Also, Vigor supports Multilingual & RTL languages. 1-click demo installation that makes your websites setting up much more swiftly and easily. The must-be-listed core features of the theme consist of Cross-browser compatibility: Chrome, FireFox, Safari, Opera, IE10; Compatible with Opal Coach, Timetable, Responsive Schedule For WordPress. Besides, Virgo was also highly rated for its strong support team who are available all the time to give you instructions and help fix effectively whatever problems you meet while building your sites. Coach is a totally worth considering Fitness theme on the trail of finding your most appropriate one. Believe us! Developed by Opal WordPress, this great theme is most suitable for fitness industry – Gym, Fitness Clubs, Personal Trainers, Health Centers and other sports and health related businesses such as Yoga, Boxing, Zumba, Training Classes and Courses. With the support of 1-click installation, you will be able to build a demo in just a second of time, without any effort. The Multipurpose WordPress Theme can be easily customized based on the intuitive theme control panel that contains lots of useful options to manage your site. Moreover, Coach is outstanding with a lot of unignorable features and plugins such as Megamenu, Grid & List Classes, Timetable Management, WooCommerce Ready, Opal Coach, Timetable Responsive Schedule For WordPress, Ease of Customization.The theme is perfectly compatible with many other plugins that allows you to enrich the source of features in your websites as you wish. You can also enjoy a great helpful support of the developers when trying on this. 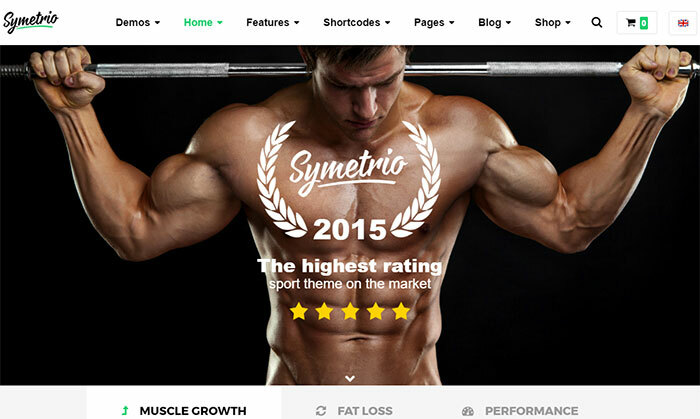 Symetrio is an ultimate WordPress theme inspired by love to fitness and sport. The theme was designed by sports enthusiasts in collaboration with the managers of fitness clubs and their clients with the desire of supporting Gym, Fitness Clubs, Personal Trainers, Health Centers and other sport and health related business and it is also suitable for any kind of sport activity like Marathon event, Dance school, Boxing classes, Crossfit and Martial arts. Symetrio now has already full payment integration with PayPal. The theme can be completely simply customized, for instance, you can change almost 99.99% of theme elements’color just using a color pickers in WordPress customizer. Like all other WordPress themes, Symetrio is one of the most optimal options for both users with no programming skills as well as advanced developers. 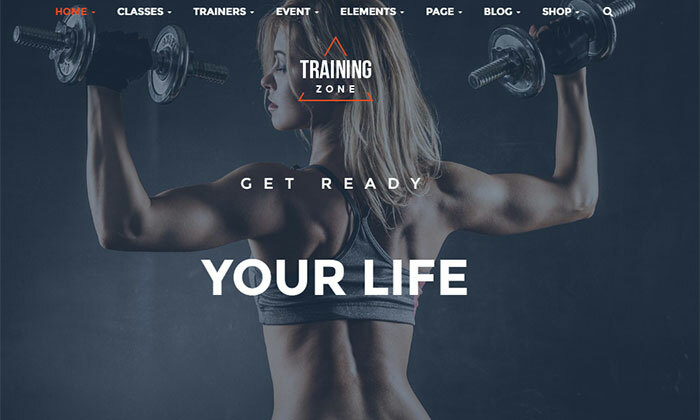 TrainingZone is a amazingly professional extremely responsive and boundlessly pliable multipurpose WordPress theme with such unique style that provides you with a variety of options in order to build a modern attractive website about gym, boxing, yoga, dancing, fitness center, health clubs, sports review magazine and sports store. With a modern and specific style of design, TrainingZone is strongly believed to bring viewers a totally brand new feeling of youth trends about training centers & clubs together with colorful images and impressive effects. The core features of this wonderful theme can be listed as Built on Visual Composer most awesome visual page builder for WordPress, Integrated Mega and vertical Menu Module With Lightweight Megamenu Editor Tool . As it is a rapidly responsive web design and retina ready, the theme can be able to adapt to screen size of any electronic devices, from computers to tablets or even mobile phones. Also, TrainingZone provides you up to 4 homepage layouts and makes you more comfortable while choosing the best suitable one for your own. Also, you can be free to create professional training courses, lessons and introduce teachers, athletes, technical equipment for students on the website. With many other excellent features, Training Zone will be an ideal choice for your next online training center business project! The theme is built for Sport Clubs, Health Clubs, Gyms, Fitness Centers, Personal Trainers and other sports and health related clubs and it is completely suitable for any kind of sport activities – aerobic, boxing, crossfit, karate, dancing. It has purpose oriented design and comes with events / classes, schedule / timetable, opening hours. This theme is highly appreciated by its marvelous design, ease of customization, and especially helpful and prompt support. Gym will certainly bring you a sense of pleasure when working on it. The theme is suitable for both users with zero programming skills as well as advanced developers. 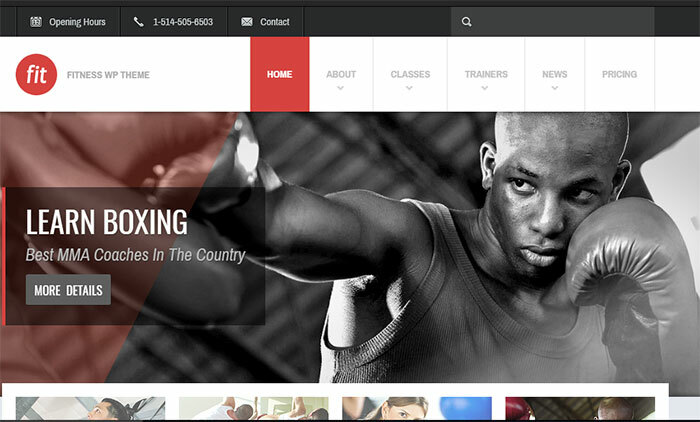 Fitness Zone WordPress theme is advantageous with modern trend of gyms, sport clubs or fitness centers and personal trainers! Thanks to fully responsive layouts that make it look perfect on mobile and tablet devices. With inbuilt drag and drop page builder you can make your site creation a whole lot easier. You can find in this functions-rich website theme Effective Skins, easy to edit modules, Mega Menu, Sticky Navigation, Mobile Nav for Smart Phones, Blog page with comments, filterable portfolio with details page variations, responsive Short-codes and working contact form page with map, and Mega pack template for your website to impress your site visitors! 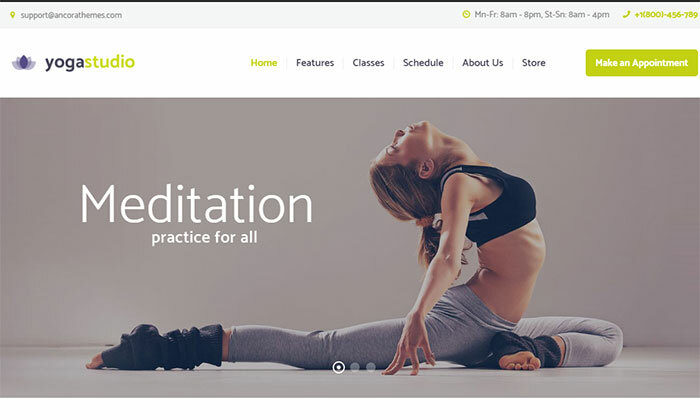 Yoga Fit – Sports, Gym & Fitness WordPress Theme is a fully responsive premium WordPress theme perfectly suiting yoga and fitness websites, like yoga studio websites, fitness classes, sports, yoga meditation, gym, dance and dancing class, etc. The unignorable key feature of the theme is a custom CMSMasters Visual Content Composer plugin included in theme archive. You can create such diverse pages using a huge shortcodes collection, including many fitness charts and yoga – related contents. You can also create a asana gallery or improve your karma with this yoga theme. 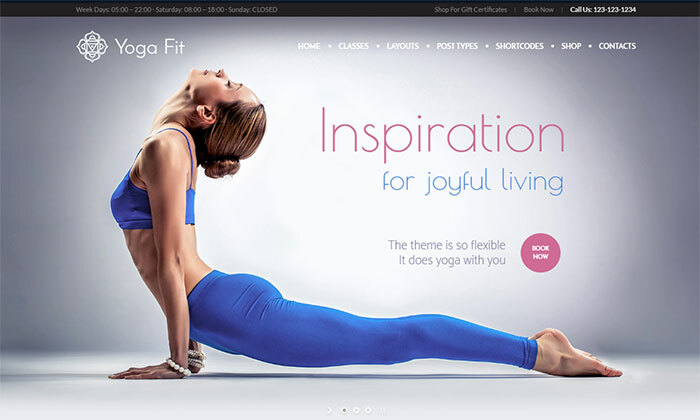 Yoga Fit – Sport, Gym & Fitness WordPress Theme features fully designed and integrated The Events Calendar and The Events Calendar PRO plugin compatibility (please note that the PRO addon needs to be purchased separately), as well as MegaMenu function. In addition, you can add events and calendars on your website as well as display your dishes and allow ordering. It has anything a fitness and sports website will need. 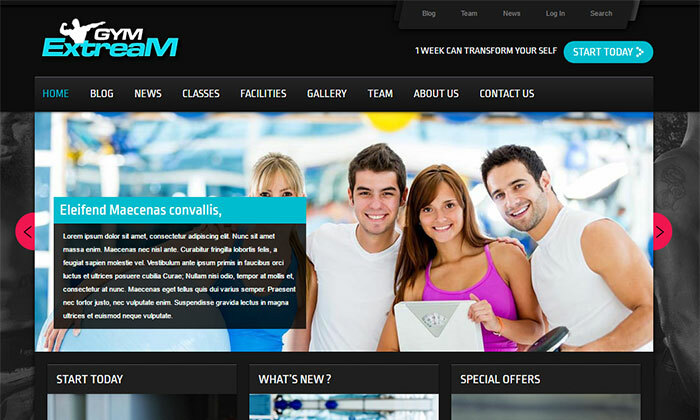 Gym Extream is a one of the best themes on Themeforest which is always ready to integrate into Gym and Fitness niche. This template is easily customizable, simple and versatile, even suitable for webmasters without any previous coding experience. The PSD files included have been customized to allow fast skinning. This template comes in 8 pre made color variations. But it will only take one minute to create your desired color schemes by using theme options. 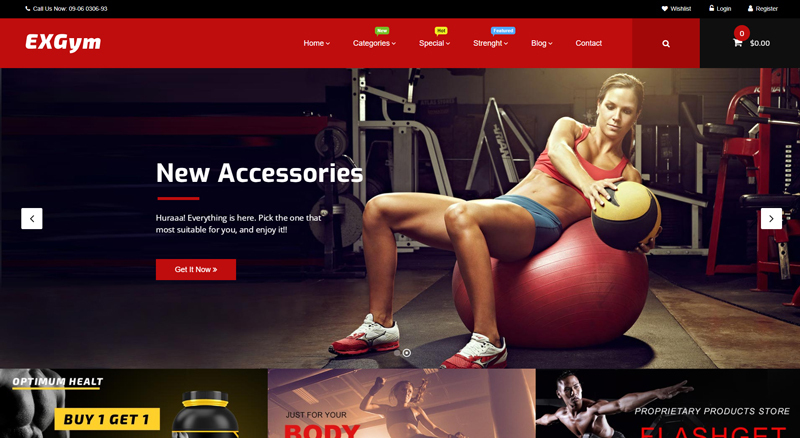 FitPro is an modern and competent Fitness Gym WordPress theme handcrafted to meet perfectly the needs of gymnasiums, fitness/sports clubs and related small businesses. The nature of the theme also makes it useful for many other types of small businesses including sites for beauty salons, spa/sauna, health/beauty clubs, law firms etc. The theme comes with plethora of features aimed at making this the most modern and most complete theme in the Fitness category. It is integrated with WooCommerce and The Events Calender plugin by Modern Tribe. A few advanced events features showcased on the demo site is available only in the paid PRO version of The Events Calendar plugin and hence requires separate purchase. FitPro is, therefore, believed to bring you everything you will need for your site’s management in a box, from installation to post scheduling. If you are still confused about choosing the greatest theme for your own unique website, why don’t you just take a look at In Shape? 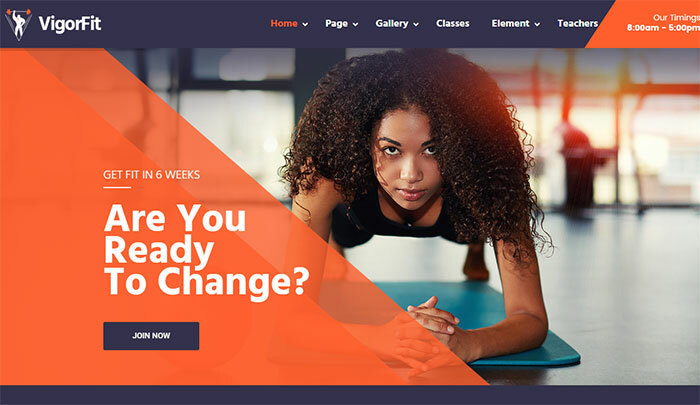 It is a clever and polished, energetic and responsive WordPress Multipurpose theme best suiting personal trainers, fitness aficionados, and even sports gyms. The theme is optimized for a Responsive viewing experience, even on hand-held devices such as mobile phones or tablets. It is also perfectly compatible with Retina screen with high quality displays. With the 1 click content installation built into framework, you can immediately set up your website in a master of second. Moreover, In Shape also comes with useful custom built SEO extension that will help attract a great amount of visitors to your site. Yogastudio has modern minimal design perfectly suitable for any type of yoga and dance studios, fitness classes, gyms, health clubs or meditation classes. Yogastudio can also fit any kind of healthcare or recreation center, spa & wellness club websites, with schedule and class descriptions. The theme is compatible with multiple awesome plugins: Revolution Slider, Booking Calendar, Essential Grid, PO Composer, Visual Composer for creating any page layout at your taste. Besides, it is fully responsive and 100% Retina ready. Yogastudio is expected to meet all of your need concerning site performance. In conclusion, The list above “Top 12+ Best Gym Fitness WordPress Themes 2017” contains some of the most awesome themes best rated by many webmasters in the world. Hoping via this list you can find out exactly the most suitable one for your upcoming project. For more choices, you can also visit our Portfolio on Themeforest for many other useful multipurpose WordPress Themes. After you purchase our themes and meet any problems, don’t hesitate and contact us via email support: help@wpopal.com or submit a ticket on our system: http://bit.ly/2klTrX2. Our technical team will check and fix them well.